When you’re a small business owner, you’re all too familiar with the day-to-day grind of keeping your business successful. Running a business while on vacation will take careful planning, but it can be done. The right level of preparation will ensure your vacation is enjoyable and your business is still working while you’re gone. Here are some tips that will make your vacation more enjoyable and the time away from your business productive. The single most important step in taking a vacation? To actually write it down and make it a priority. Put it at the very top of your to-do list. Research shows that it’s actually beneficial to your health and productivity to take a vacation. The process of planning and the anticipation of going on vacation also has direct correlation to improving your happiness. Alert your employees of your scheduled vacation. Let them know ahead of time when you’ll be gone and when you’ll be back. It’s also important to let them know what you expect of them while you’re gone. You may want to personally alert customers and clients you’re directly working with at the time that you’ll be gone. Letting them know you’re away, before they receive an out-of-office reply or voicemail message, will remind them how important they are to you and your business. With advance planning, your business should still be running, even if you’re taking a break. If you can’t completely unplug and you’ll be traveling with your smart phone and laptop, schedule a specific time you will be available to help with problems or questions back at work. This will help you and your staff stay connected, without having to worry about the day-to-day dealings of the office during your entire vacation. If you have employees, having a designated second-in-command is a smart idea. This person also might be the individual who has the ability to reach you while you’re gone if something should come up that immediately needs your attention. You may need to unwind, or perhaps you’re itching for a few days at the beach or on the slopes. Vacations can act as motivation. 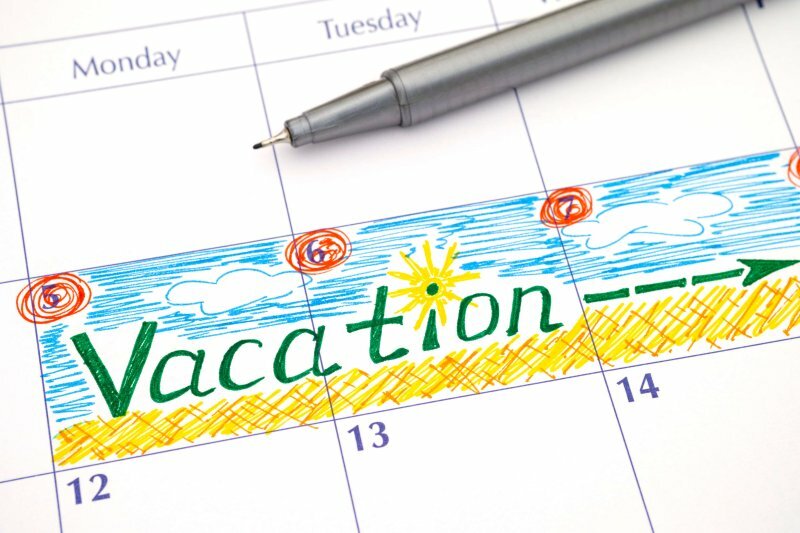 Clinical psychologist Francine Lederer observed, “most people have better life perspective and are more motivated to achieve their goals after a vacation.” Employees who have taken vacations report feeling more creative and refreshed after they’ve disconnected from work. According to a study conducted by the Society for Human Resource Management, 77 percent of managers agree that employees who take most or all of their vacation time are more productive in their jobs than those who do not. HR managers believe that taking vacation time and using it leads to a 75 percent higher performance and a 78 percent increase in job satisfaction. Whether you’re considering taking time off as a business owner or you’re encouraging your employees to take a vacation, it’s important to acknowledge the positive impact a little break can have on the overall health of the business. Whether or not you take full advantage of your vacation days, remember that taking some quality time off is an important way to recharge and relax, and it can be done successfully through careful planning, effective communication, and establishing rules.